The Fed’s balance sheet is comprised of approximately $2.5 trillion in Treasury securities and $1.8 trillion in mortgage backed securities. The following graph shows how its balance sheet has grown since 2009 through 2014 when it stopped its bond-buying program. 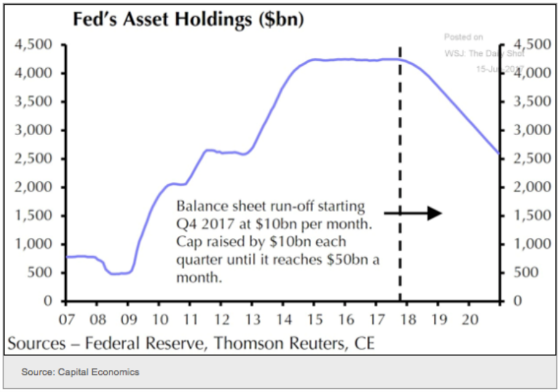 The runoff started in September and here is the expected path for the Fed’s assets. Many people worry that long-term interest rates will rise due to less demand from the Fed and with such a large buyer out of the market then investors will have to be presented with higher yields to purchase new Treasury securities. While on the surface this fear is understandable, most things sometimes require going below the surface to be able to have a more informed opinion. I’m not very worried about interest rates rising on the long end once the balance sheet reduction is in full force. The first thing I did was to look at what happened to interest rates when the three quantitative easing programs were implemented. One would understandably think that 10-year Treasury yields would have dropped due to the higher demand from the Fed. Well, you would have been wrong as the following tables show. Note: The yields for the beginning are on the first trading day of the month and the yields for the end are for the last trading day of the month. Do you notice any pattern here? Yields rose in all three cases despite the Fed being a very active buyer of Treasuries. Perhaps investors sensed that a more accommodating Fed would be very friendly to the economy and risky investments like stocks so they moved into higher risk investments and sold Treasuries. Now you may argue that what is different this time is that the Fed is no longer reinvesting all of the proceeds from its maturing Treasuries so this will require new buyers to step in. Ignoring the experience of rates rising when the Fed was buying and logically wondering why couldn’t they fall when the Fed is not buying, the amount they are not reinvesting is very manageable. 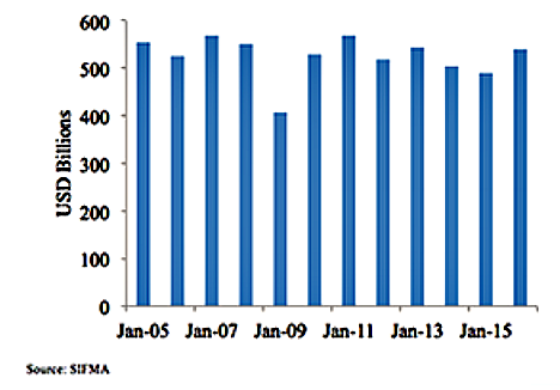 The following is a chart that shows average daily trading volume in the Treasury market. And yes you are reading it right when you see that it’s about $500 billion per day. Thus, the Fed not reinvesting $30 billion per month, or approximately $1.5 billion per day, is about 5% of the daily trading volume. It’s not insignificant but it’s probably not enough to impact the market. 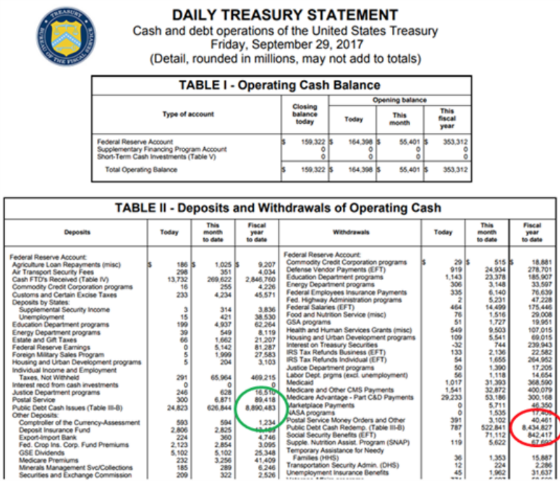 And to put the relatively minor impact of $30 billion per month of Treasury runoff in some further perspective, the following table shows the annual amount of Treasuries issued and redeemed for the fiscal year ending September 30, 2017. The key numbers are circled below. They may be hard to read so I will tell you what they are. In the fiscal year ending September 30, 2017, the Treasury issued bills and notes worth $8.9 trillion and redeemed $8.4 trillion. And yes, that was trillion. Given the incredible depth of the Treasury market, I think there will be buyers for the $360 billion the Fed does not reinvest from maturing securities over the next year. 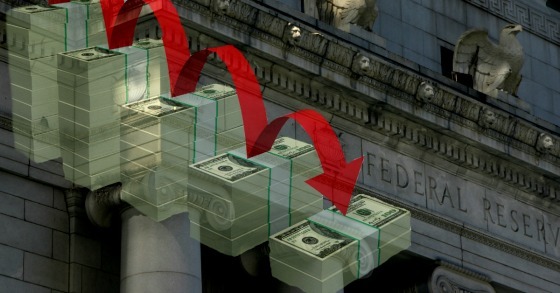 There is also a shortage of safe collateral like Treasuries among financial institutions that they can use to borrow from the repo market so this should buoy demand as well as they look to increase their inventory of leverageable Treasuries. Another factor tempering my concern about higher rates is the flattening yield curve. The following chart shows the difference in yields between 10-year Treasuries and 2-year Treasury notes. The larger the spread the more confidence bond market investors have in future economic growth while the more narrow (or inverted) the less they have. And when it does invert it almost always foreshadows a recession. Despite tax cuts, a low unemployment rate, higher GDP, rising home prices, strong manufacturing output, a synchronized global recovery, and decent job growth, the yield curve has been narrowing since 2011. The bond market does not seem convinced that the U.S. economy can produce persistent, high rates of growth. We are basically in a 2% GDP growth environment for the long-term according to Treasury investors. So what happened to interest rates during these yield curve compression cycles? Here is the 10-year Treasury note yield at the peak and trough of the 10 minus 2 spread for the previous two cycles as well as 30-day Libor. The first cycle was the more traditional post-WWII one in which the Fed tightens to fight inflation and both long and short rates go up but long rates rise more rapidly. Ultimately the Fed goes too far and then both come down, with short rates declining more significantly. The 2003-6 and current cycle I think are more typical of a slow growing, demographically challenged, debt-reliant, automation-focused economy in which long rates come down or do not rise materially while the Fed tightens because bond market investors don’t see as rosy a future as the Fed and know that Fed hikes will slow the economy so they price this into longer-term yields. Eventually, some crisis happens and the Fed reverses course and short rates come down pretty significantly. It’s interesting to note that each cycle started with the spread being within in a pretty tight range at its peak (between 263 and 291 basis points). The stock market was far ahead of the bond market, however, in hitting a bottom. For example, during the NASDAQ meltdown stock prices hit a low in October 2002, approximately nine months ahead of the yield curve being at its widest. After the subprime collapse, the market hit bottom in March 2009, a little less than two years ahead of the yield curve. The yield curve was far ahead of the stock market in calling the recession of December 2007-June 2009 and slightly behind the market in calling the recession of March 2001 – November 2001. It took quite a bit of time for a recession to materialize when the spread hit 50 basis points, which is approximately where it is today. In the first cycle, it took over five years and a massive technology rally and bubble while the second one was a little more than two years away and included the peaking of the housing bubble. Housing isn’t much of a worry now but clearly, the stock market and technology stocks are on fire and tax reform may pose some unintended consequences. It now makes some sense why some people are talking about a melt-up rally (or continuation of it) before it reaches its peak. 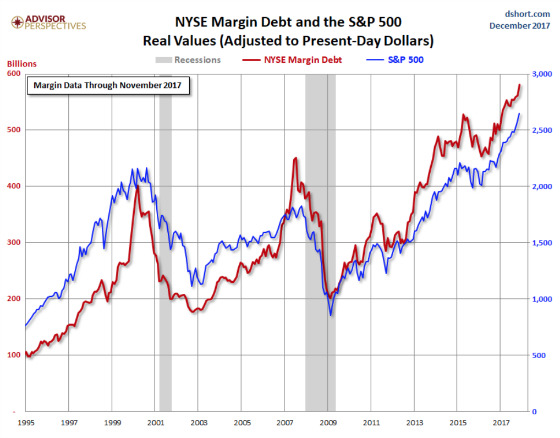 One thing to watch out for, however, is margin debt as it tends to be a source of fuel for all bull markets and this one has definitely been burning on all cylinders from a borrowing perspective. If history is any guide then it doesn’t look like long rates have much to move if the yield curve keeps flattening and ultimately goes to negative. Two more rate hikes and some Treasury yield compression on the long end can do the trick. One can see that Libor is usually about 50 basis points lower than the two-year Treasury yield which would imply that it would probably top out at around 2% before drifting lower if the yield curve goes negative. Does the Fed Have Enough Interest Rate Ammunition to Fight the Next Recession? One can see the Fed’s concern about not having enough interest rate ammunition to fight the next recession as the two-year yield was 6.33% in 2000, 4.85% in 2006, and presumably 2.50% after two more tightenings now when the yield curve will probably invert. That’s just the way it is as we have been in a long-term trend of lower highs and lower lows when it comes to Treasury yields so the Fed will have to enter the next recession with less interest rate arrows in their quiver. I still remain in the camp of lower rates for a longer period of time. ‹ Housing – Is It The Best Long-Term Investment? MBS also on the runoff. No effect on this subclass too?